This homeless man is getting a huge amount of attention after a video went viral that showed him playing on a public piano. 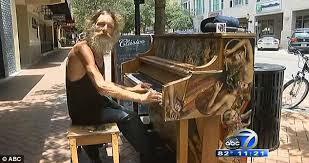 It happened on the sunny streets of Florida when homeless man, Donald Gould was downtown playing on one of the public pianos. The sounds he was making was so captivating her breath was taken away, and she couldn’t help but catch some of it on camera. To make things even more amazing, Gould who is broke teaches kids who are interested in learning piano for free. Please Share this video with your friends, everyone needs to see this!